Since it’s Sunday (okay, it’s Monday, but close enough), I figured I might as well write about a few things that I fail to understand about Christianity. 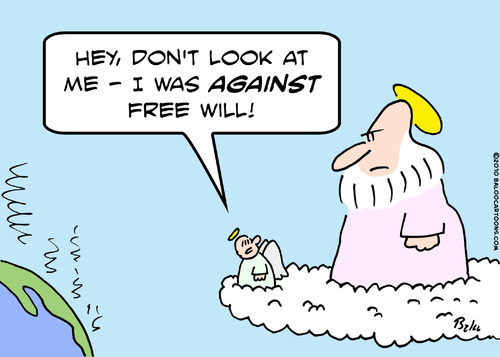 One is the idea of free will. Not that I don’t BELIEVE in free will; I’m not a fatalist. What bothers me is when people act like it’s great that God gives you free will, but then insist that there’s only one right choice. Doesn’t that make the whole thing essentially a Hobson’s choice? Believe one particular thing, or rot in your sin and be tortured for eternity? Giving someone options when there’s only one right one isn’t really all that reasonable, is it? I would think that a deity who really favors free will and loves humanity would give multiple correct choices. Yeah, that’s pluralism, but it seems to me like the only way free will could be considered a gift rather than a trick. Also, there’s the whole idea of Jesus being able to free people, including people who hadn’t even been born yet, from sin by dying on the cross. First of all, if you believe Jesus and God are the same, then I don’t see how sacrificing yourself to yourself is all that impressive, especially if you get to come back a few days later anyway. Actually, the Jesus of Matthew and Mark, who cries out about God having forsaken him, is a little more acceptable in this respect. Since he doesn’t KNOW that he’s saving mankind and coming back to life, it seems that his sacrifice means a little more. I can’t help but think of Harry Potter and the Deathly Hallows, since I just saw the movie. In order to defeat Voldemort, Harry has to THINK he’s going to die and be prepared to do so, even though he ends up surviving. It’s more or less the same thing, except nobody thinks Harry is eliminating sin by dying (at least as far as we know). I guess the whole concept of sacrifice to God is rather bizarre to me, because if the Almighty really wants animals set on fire, He could presumably do that Himself. But I think the point of animal sacrifice was that you were giving up something that was important to you, as well as assuaging some of the guilt brought on by eating meat. Even though I’m an atheist and an omnivore, I have to suspect it was in some ways more civilized than today’s factory farming. With Jesus, though, the people who loved him weren’t the ones who offered him up to die. It was really more akin to the concept of the scapegoat, as explained in Leviticus 16. Basically, the idea is that an innocent life is taken to atone for the sins of the guilty. The question is, isn’t the whole reason a lot of people believe in God that they want to think there’s an overarching sense of fairness and justice to the universe? How is letting an innocent being die for others at all fair or just? You say God’s justice isn’t our justice? Then how do we know it even IS justice, and not just God messing with us? Another issue I have concerns the favorite verse of the rainbow-haired guy at sporting events, John 3:16: “For God so loved the world that he gave his only Son, so that everyone who believes in him may not perish but may have eternal life.” Let me break this down. God loves the whole world, but did his son die for the whole world? Nope. Only for those who believe in him, which I don’t think would even count everyone who calls himself or herself a Christian. The way I see, true belief, as opposed to the “yeah, sure, could be” sort, is hardly a matter of just flicking a switch in your brain. It isn’t like everyone who doesn’t believe in Jesus saving them from sin is doing so out of sheer orneriness. If Jesus is really so loving, why didn’t he die for the people who DON’T believe in him as well? Why is belief such an important factor here? And if it has to be, how about providing a little more proof? I’m sorry, but some ancient book that also promotes genocide isn’t going to cut it. This entry was posted in Christianity, Religion and tagged belief, bible, free will, gospel of john, gospel of mark, gospel of matthew, harry potter and the deathly hallows, hell, jesus, leviticus, pluralism, sacrifice, scapegoat, sin, voldemort. Bookmark the permalink. Jesus knew he was going to die, and he died for everyone. Not just for those who loved him. But whether you CHOOSE to accept his saving grace, now that’s another question. These question, its best you bring it up to a local pastor, they can answer you better and help you understand. I personally believe in God not because im looking for a religion, but because Christianity is not a religion, rather a relationship. I see how god works in my life everyday, and i can feel his presence and love everytime. And, since you related to Harry potter, i’ll relate it too. I was in a potter mood when i asked God what dumbledore asked snape, “after all these time (i abandoned you, i ignored you, i hurt you) ?”, And i heard God reply, “Always.” I couldnt help but feel touched. Just like snapes undenying love for lily, so its God’s for me. How could Christianity not be a religion? It holds that there’s a controlling power in the universe, right? It may be a relationship as well, but that doesn’t mean it isn’t a religion. Its a religion because people label it as one. yes, but when people think religion, they think a set of rules etc etc. If you ask christians, christians who have a relationship with god, not those who just call themselves and dont act like one, ask them if they think christianity is a religion or a relationship. Because if christianity is a religion, oh wow, i dont think i will talk to God the way i do today. Man, he’ll strike me. Many (perhaps all) religions include rules, but I don’t think that’s what makes a religion. Religion, to my mind, is more a matter of belief. What it seems like you’re trying to say is that you don’t see Christianity as dogmatic. For my part, though, I think saying you have to believe some specific supernatural thing IS a rule.